While the Wolves are off in China, I stopped in Salt Lake City on my way home from training camp in San Diego for Ricky Rubio’s first game in a Utah uniform on Monday night. It’s strange to see him wearing Jazz green, gold and blue, with the number 3 instead of 9. It’s stranger still to see him what he calls now “grown up.” From a distance in the Jazz’ practice gym, I barely recognized him: Muscular, particularly through the arms, his hair grown out and often gathered in a man bun, a full beard instead of the wispy one he usually sported in Minnesota. Appropriate, I guess, that he looks like a mountain man now that he looks out at the Wasatch range everywhere he goes. "I can go in a cave and spend days there now," he said, smiling. He also has a full sleeve tattoo down his right arm of what appears to me to be a lioness and her cub. And change he has, in appearance and address. Traded by the Wolves to Utah last summer for Oklahoma City’s 2018 first-round draft pick, he now calls home Salt Lake City, which he compares in many ways to Minneapolis but perhaps without the same restaurant scene. “It was time, I guess,” he said. He played with his new teammates Monday night against the Australian league’s Sydney Kings. He made sure he watched his former Wolves team’s preseason opener Saturday against the Lakers. He keeps in touch with many of them, particularly close friend Nemanja Bjelica, and predicts Jimmy Butler will lead the Wolves to where they never reached during Rubio’s six seasons in Minnesota. “He’s going to help that team make the playoffs,” Rubio said. I asked about this possibly being a breakout season for Andrew Wiggins or Karl-Anthony Towns. Reaching the playoffs would be a good start. His job now is to get Utah back to the playoffs after the Jazz made it to the second round last season. All-Star Gordon Hayward is gone to Boston, of course, and Utah coach Quin Snyder is remaking his offense around Rubio and center Rudy Gobert, two players whose size for their positions he intends to exploit. He now wears No. 3 because the Jazz retired No. 9 in honor late owner Larry Miller, who wore that jersey number during a fast-pitch softball career that helped launch a business life in sports and automobile sales. 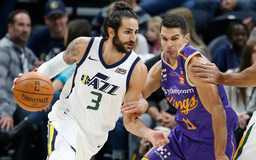 The Jazz have retired 12 uniform numbers, everyone from Miller to such players as Pete Maravich and John Stockton, both of whom Rubio studied while growing up. “It was one of the ones left,” Rubio said about choosing No. 3. At the Jazz’s morning shoot Monday, we had a wide-ranging discussion on everything from his praise for the Jazz “culture” and why he never really felt one in Minnesota because of the constant change of coaches and GMs to how everything might have changed if he had torn his ACL late in his rookie season. We also talked about his love for the people in Minnesota and the love he felt there, how it’ll always be a part of him and how he intends to visit a place he didn’t know and where he didn’t really want to play when he was drafted fifth overall in 2009. He also talked about the biggest political crisis in decades back home in Spain and his native Catalonia, where thousands have protested their anger over a violent police crackdown after a contested referendum seeking Catalonia’s independence. Much of our conversation will be a story aimed for his return to Minnesota with the Jazz in the season’s second game, the Wolves’ home opener on Oct. 20. Listen: What did we learn watching the Wolves for the first time this year? Are Thibodeau's Timberwolves going to push the pace this season?